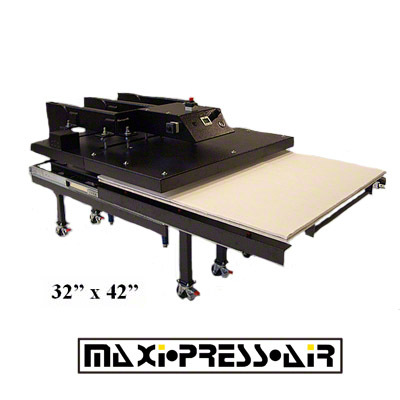 George Knight® MAXI•PRESS™ Twin Shuttle Station with Top and Bottom Heat; air operated 44" x 64" multipurpose large format press. 1 year warranty.208-230V, 3ph, 36,000 watts, 86A. Compressor required. 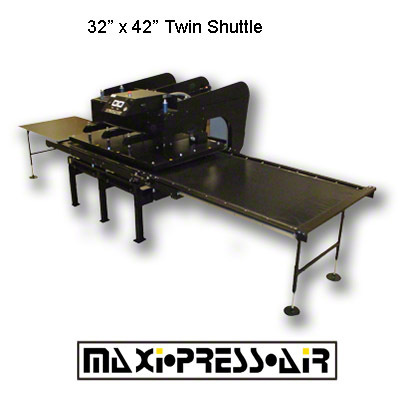 George Knight® MAXI•PRESS™ Twin Shuttle Station; air operated 44" x 64" 220v - Multipurpose large format press. Oversized platen, production oriented press. 1 year warranty. 220v, 1ph, 85A - Compressor required. 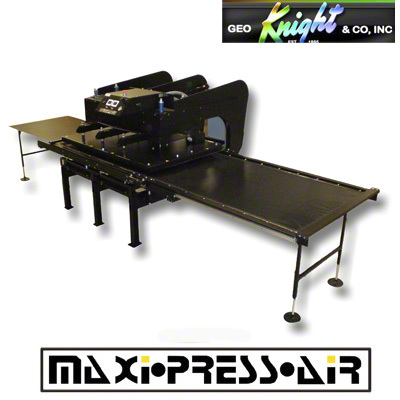 George Knight® MAXI•PRESS™; air operated 44" x 64" 220v - Multipurpose large format press. Oversized platen, production oriented press. 1 year warranty. 220v, 1ph/85A - Compressor required. 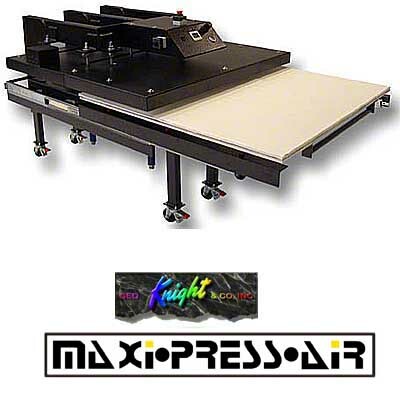 George Knight® MAXI•PRESS™; Air operated with Top and Bottom Heat; 44" x 64" 220v - Multipurpose large format press. Oversized platen, production oriented press. 1 year warranty. 220v, 3ph, 86A - Compressor required. 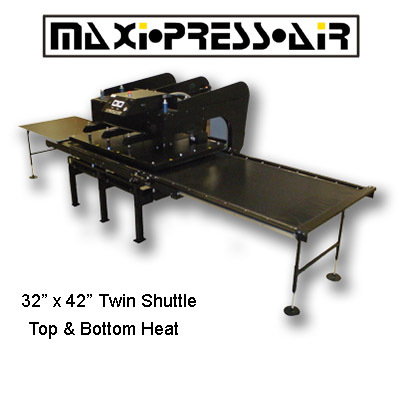 George Knight® MAXI•PRESS™ Twin Shuttle Station with Top and Bottom Heat; air operated 32" x 42" - multipurpose large format press. 1 year warranty. 208-230V, 1ph, 18,000 watts – 100A breaker required - Compressor required. 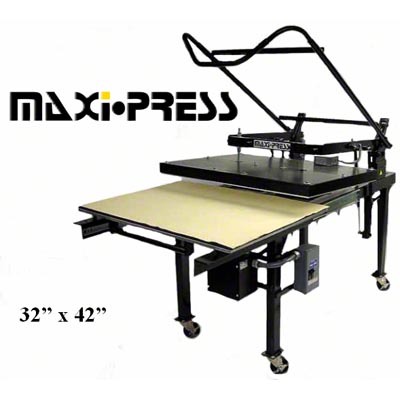 George Knight® MAXI•PRESS™ Twin Shuttle Station; air operated 32" x 42" 220v - multipurpose large format press. Oversized platen, production oriented press. 1 year warranty. 220v, 1Ph, 43A - Compressor required. 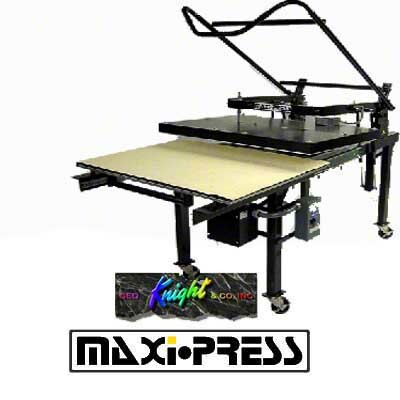 George Knight® MAXI•PRESS™; air operated 32" x 42" 220v - multipurpose large format press. Oversized platen, production oriented press. 1 year warranty. 220v, 1Ph, 43A - Air required. 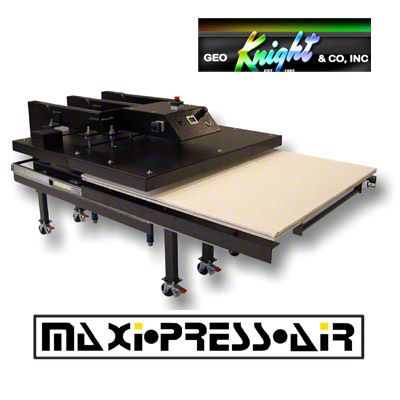 George Knight® MAXI•PRESS™; air operated with Top and Bottom Heat; 32" x 42" 220v - multipurpose large format press. Oversized platen, production oriented press. 1 year warranty. 220v, 1Ph, 86A -Compressor required.